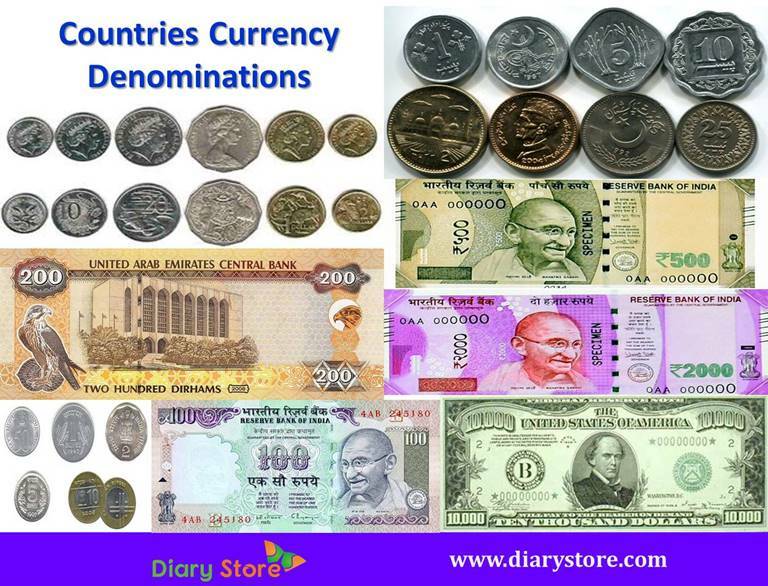 Countries Currency Denominations - Denomination is official value of currency, generally for Coins, Note denominations, stamp, stamp paper, etc., as printed, engraved, perforated, embossed, or stamped on it. Here we listed all countries denomination of currency. AFN 1,000, 500, 100, 50, 20, 10, 5, 2 and 1. Currency Denominations: lek 5,000, 1,000, 500, 200 and 100. Coin Denominations: lek 100, 50, 20, 10 and 5. Coin Denominations: cent, nickel, dime, quarter, half dollar, and dollar. Coins: AR$5, 2 and 1, and in 50, 25, 10, 5 and 1 centavos. Notes: B$100, 50, 20, 10, 5, 3 and 1, and 50 cents. Coins: 25, 15, 10, 5 and 1 cents. Notes: ƒ250, 100, 50, 25, 10 and 5. Coins: ƒ5, 2.5, 1 and 50, 25, 10, 5 and 1 cents. Notes: KM200, 100, 50, 20, 10, 5 and 1 and 50 pfenings. Coins: KM2 and 1, and 50, 20 and 10 pfenings. Notes: P100, 50, 20 and 10. Coins: P5, 2 and 1, and 50, 25, 10 and 5 thebe. Notes: CR100, 000, 50,000, 20,000, 10,000, 5,000, 2,000, 1,000, 500, 200 and 100. Notes: CFA10, 000, 5,000, 2,000, 1,000 and 500. Coins: CFA250, 100, 50, 25, 10, 5, 2 and 1. Notes: C$100, 50, 20, 10 and 5. Coins: C$2 and 1, and 25, 10, 5 and 1 cents. Notes: CVE5, 000, 2,000, 1,000 and 500. Coins: CVE200, 100, 50, 20, 10, 5 and 1. Notes: CI$100, 50, 25, 10, 5 and 1. Coins: 25, 10, 5 and 1 cents. Notes: XAF10, 000, 5,000, 2,000, 1,000 and 500. Coins: XAF500, 100, 50, 25, 10, 5 and 1. Notes: CH$20,000, 10,000, 5,000, 2,000, 1,000 and 500. Coins: CH$500, 100, 50, 10, 5 and 1. Notes: ¥100, 50, 20, 10, 5 and 1, and 5 and 1 chiao/jiao. Coins: ¥1, 5 and 1 chiao/jiao and 5, 2 and 1 fen. Notes: CUC$100, 50, 20, 10 and 5. Coins: CUC$1, and 20, 5, 2 and 1 centavos. Note Denominations: €500, 200, 100, 50, 20, 10 and 5. Coins: €2 and 1, and 50, 20, 10, 5, 2 and 1 cents. Note Denominations: 5,000, 2,000, 1,000, 500, 200, 100 and 50Kc. Coins: 50, 20, 10, 5, 2 and 1Kc, and 50 haler. Note Denominations: kr 1,000, 500, 200, 100 and 50. Coins: kr 20, 10, 5, 2 and 1, and 50 and 25 øre. Note Denominations: RD$2,000, 1,000, 500, 100, 50, 20 and 10. Coins: RD$1 and 5 and 50, 25, 10, 5 and 1 centavos. Note Denominations: EC$100, 50, 20, 10 and 5. Coins: EC$1, and 50, 25, 10, 5, 2 and 1 cents. Note Denominations: $100, 50, 20, 10, 5, 2 and 1. Coins: $1, and 50, 25, 10, 5 and 1 cents. Note Denominations: E£200, 100, 50, 20, 10, 5, 1, 50 piastres and 25 piastres. Coins: 25, 20, 10 and 5 piastres. Note Denominations: Kr500, 100, 50, 25, 10, 5, 2 and 1. Coins: Kr5 and 1, and 50, 20, 10 and 5 senti. Note Denominations: Br100, 50, 10, 5 and 1. Coins: 50, 25, 10, 5 and 1 cents. Note Denominations: £50, 20, 10 and 5. Coins: £2 and 1, and 50, 20, 10, 5, 2 and 1 pence. Note Denominations: F$50, 20, 10, 5 and 2. Coins: F$1, and 50, 20, 10, 5, 2 and 1 cents. Coins: €2 and 1, and 50, 20, 10, 5 cents. Note Denominations: XPF10, 000, 5,000, 1,000 and 500. Coins: XPF100, 50, 20, 10, 5, 2 and 1. Note Denominations: XAF10,000, 5,000, 2,000, 1,000 and 500. Note Denominations: D100, 50, 25, 10 and 5. Note Denominations: GEL100, 50, 20, 10, 5, 2 and 1. Coins: 50, 20, 10 and 5 tetri. Note Denominations: ¢50, 20, 10, 5 and 1. Coins: ¢1 and 50, 20, 10, 5 and 1 pesewas. Note Denominations: Gib£50, 20, 10 and 5 for local use only and issued by the Gibraltar government. Coins: Gib£5, 2 and 1, and 50, 20, 10, 5, 2 and 1 pence. Note Denominations: G$1,000, 500, 100 and 20. Coins: G$10, 5 and 1. Note Denominations: HTG500, 250, 100, 50, 25, 10, 5, 2 and 1. Coins: HTG5 and 1, and 50, 20, 10 and 5 centimes. Note Denominations: L500, 100, 50, 20, 10, 5, 2 and 1. Coins: 50, 20, 10, 5, 2 and 1 centavos. Note Denominations: HK$1,000, 500, 100, 50, 20 and 10. Coins: HK$10, 5, 2 and 1, and 50, 20 and 10 cents. Note Denominations: Ft20, 000, 10,000, 5,000, 2,000, 1,000, 500 and 200. Coins: Ft100, 50, 20, 10 and 5. Note Denominations: kr5, 000, 2,000, 1,000 and 500. Coins: kr100, 50, 10, 5 and 1. Note Denominations: ₹ 2, 000, 1,000, 500, 100, 50, 20 and 10. Note Denominations: Rp100, 000, 50,000, 20,000, 10,000, 5,000, 1,000 and 500. Coins: Rp1, 000, 500, 100, 50 and 25. Note Denominations: Rs50,000, 20,000, 10,000, 5,000, 2,000, 1,000, 500, 200 and 100. Coins: Rs500, 250, 100 and 50. Note Denominations: ID25,000, 10,000, 5,000, 1,000, 500, 250 and 50. Note Denominations: 200, 100, 50, and 20. Coins: 100, 50, 10, 5 and 1, and 50 and 10 agorot. Note Denominations: XOF10, 000, 5,000, 2,000 and 1,000. Coins: XOF500, 200, 100, 50, 25, 10, 5 and 1. Note Denominations: J$1,000, 500, 100 and 50. Coins: J$20, 10, 5 and 1, and 25, 10 and 1 cents. Note Denominations: ¥10,000, 5,000, 2,000 and 1,000. Coins: ¥500, 100, 50, 10, 5 and 1. Note Denominations: JD50, 20, 10, 5 and 1, and 500 fils. Coins: JD1, 1/2 and 1/4; 10, 5, 2 and 1/2 piastres; and 1 and 1/2 qirsh. Note Denominations: KZT10, 000, 5,000, 2,000, 1,000, 500 and 200. Coins: KZT100, 50, 20, 10, 5, 2 and 1. Note Denominations: KSh1,000, 500, 200, 100 and 50. Coins: KSh20, 10 and 5. Note Denominations: RSD5,000, 1,000, 500, 200, 100, 50, 20 and 10. Coins: RSD20, 10, 5, 2 and 1. Coins: 100, 50, 20, 10, 5 and 1 fils. Note Denominations: KGS 1,000, 500, 200, 100, 50, 20, 10, 5 and 1, and 50, 10 and 1 tyin. Note Denominations: LAK 50,000, 20,000, 10,000, 5,000, 2,000, 1,000, 500, 100, 50, 10, 5 and 1. Note Denominations: Ls500, 100, 50, 20, 10 and 5. Coins: Ls2 and 1, and 50, 20, 10, 5, 2 and 1 santims. Note Denominations: L£100,000, 50,000, 20,000, 10,000, 5,000, 1,000, 500, 250, 100, 50, 25, 10, 5 and 1. Coins: L£500, 250, 100 and 50. Note Denominations: L$100, 50, 20, 10 and 5. Coins: L$1 and 50, 25, 10 and 5 cents. Note Denominations: LD20, 10, 5, 1, 1/2 and 1/4 dinars. Coins: 100, 50, 20, 10, 5 and 1 dirhams and 1/2 and 1/4 dinars. Note Denominations: SFr1,000, 200, 100, 50, 20 and 10. Coins: SFr5, 2 and 1, and 50, 20, 10 and 5 rappen/centimes. Note Denominations: Lt500, 200, 100, 50, 20 and 10. Coins: Lt5, 2 and 1, and 50, 20, 10, 5, 2 and 1 centas. Note Denominations: MOP$1,000, 500, 100, 50, 20 and 10. Coins: MOP$10, 5, 2 and 1, and 50, 20 and 10 avos. Note Denominations: MKD 5,000, 1,000, 500, 100, 50 and 10. Coins: MKD 5, 2 and 1, and 50 deni. Coins: Ar50, 20, 10, 5, 2 and 1. Note Denominations: Mk500, 200, 100, 50, 20, 10 and 5. Coins: Mk1 and 20, 10, 5, 2 and 1 tambala. Note Denominations: RM100, 50, 10, 5, 2 and 1. Note Denominations: MRf500, 100, 50, 20, 10 and 5. Coins: MRf2 and 1, and 50, 25, 10, 5, 2 and 1 laari. Note Denominations: XOF10, 000, 5,000, 2,000, 1,000 and 500. Coins: XOF500, 100, 50, 25, 10, 5 and 1. Note Denominations: MRO2, 000, 1,000, 500, 200 and 100. Coins: MRO20, 10, 5 and 1, and 1 and 0.2 khoums. Note Denominations: Rp2, 000, 1,000, 500, 200, 100, 50 and 25. Coins: Rp10, 5 and 1, and 50, 20, 10, and 5 cents. Note Denominations: M$1,000, 500, 200, 100, 50 and 20. Coins: M$100, 50, 20, 10, 5, 2 and 1, and 50, 20, 10 and 5 centavos. Coins: 50, 25, 10, 5 and 1 bani. Note Denominations: MNT20, 000, 10,000, 5,000, 1,000, 500, 100, 50, 20, 10, 5 and 1. Coins: MNT500, 200, 100, 50 and 20. Note Denominations: Dh200, 100, 50, 20 and 10. Coins: Dh10, 5 and 1, and 50, 20, 10 and 5 centimes. Note Denominations: MT1, 000, 500, 200, 100, 50 and 20. Coins: MT10, 5, 2 and 1 and 50, 20, 10, 5 and 1 centavos. Note Denominations: K1,000, 500, 200, 100, 50, 20, 10, 5 and 1. Note Denominations: N$200, 100, 50, 20 and 10. Coins: N$5, N$1, 50 cents, 10 cents and 5 cents. Note Denominations: W10,000, 5,000 and 1,000. Coins: W500, 100, 50 and 10. Note Denominations: Rs1,000, 500, 100, 50, 20, 10, 5, 2 and 1. Coins: 50, 25 and 10 paisa. Note Denominations: NZ$100, 50, 20, 10 and 5. Coins: NZ$2 and 1, and 50, 20 and 10 cents. Note Denominations: C$500, 100, 50, 20 and 10. Coins: C$5 and 1, and 50, 25, 10 and 5 centavos. Note Denominations: XOF10,000, 5,000, 2,000 and 1,000. Note Denominations: NGN 500, 200, 100, 50, 20, 10 and 5. Coins: NGN 1 and kobo 25, 10, 5 and 1. Note Denominations: Kr1,000, 500, 200, 100 and 50. Coins: Kr20, 10, 5 and 1, and 50 øre. Note Denominations: OMR50, 20, 10, 5 and 1, and 500, 250, 200 and 100 baiza. Coins: 50, 25, 10 and 5 baiza. Note Denominations: PKR 5,000, 1,000, 500, 100, 20 and 10. Coins: PKR 5, 2 and 1. Note Denominations: ?200, 100, 50, and 20. Coins: ?100, 50, 10, 5 and 1, and 50 and 10 agorot. Note Denominations: There are no Panamanian bank Note denominations. Coins: B/.10 and 1, and 50, 25, 10, 5 and 1 centavos. Note Denominations: K100, 50, 20, 10, 5 and 2. Coins: K1, and 50, 20, 10, 5, 2 and 1 toea. Note Denominations: Gs100,000, 50,000, 20,000, 10,000, 5,000 and 1,000. Coins: Gs500, 100, 50, 10 and 5. Note Denominations: PEN 200, 100, 50, 20 and 10. Coins: PEN 5, 2 and 1, and 50, 20, 10, 5 and 1 céntimos. Note Denominations: Php1, 000, 500, 200, 100, 50, 20, 10 and 5. Coins: Php10, 5, 2 and 1, and 50, 25, 10 and 5 centavos. Note Denominations: zl200, 100, 50, 20 and 10. Coins: zl5, 2 and 1, and 50, 20, 10, 5, 2 and 1 groszy. Note Denominations: QR500, 100, 50, 10, 5 and 1. Coins: 50 and 25 dirhams. Note Denominations: Lei500, 100, 50, 20, 10, 5 and Leu1. Coins: 50, 10, 5 and 1 bani. Note Denominations: RUB 5,000, 1,000, 500, 100, 50 and 10. Coins: RUB 10, 5, 2 and 1, and 50, 10, 5 and 1 kopeks. Note Denominations: RWF5,000, 1,000, 500 and 100. Coins: RWF50, 20, 10, 5, 2 and 1. Note Denominations: St$100, 50, 20, 10, 5 and 2. Coins: St$1, and 50, 20, 10, 5, 2 and 1 sene. Note Denominations: SAR500, 100, 50, 10, 5 and 1. Coins: 50, 25, 10, and 5 halala. Coins: RSD 20, 10, 5, 2 and 1. Note Denominations: Rp500, 100, 50, 25 and 10. Coins: Rp5 and 1, and 25, 10, 5 and 1 cents. Note Denominations: S$10,000, 1,000, 500, 100, 50, 10, 5 and 2. Coins: S$1, and 50, 20, 10, 5 and 1 cents. Note Denominations: SI$50, 20, 10, 5 and 2. Coins: SI$1, and 50, 20, 10, 5, 2 and 1 cents. Note Denominations: S500, 100, 50, 20, 10 and 5. COINS: S1, and 50, 10 and 5 cents. Note Denominations: R200, 100, 50, 20 and 10. Coins: R5, 2 and 1, and 50, 20, 10 and 5 cents. Note Denominations: Rp2,000, 1,000, 500, 200, 100, 50, 20 and 10. Coins: Rp10, 5, 2 and 1, and 50, 25, 10, 5, 2 and 1 cents. Note Denominations: SDG50, 20, 10, 5, 2 and 1. Coins: 50, 20, 10, 5 and 1 piasters. Note Denominations: S$100, 50, 20, 10 and 5. Coins: 250, 100, 25, 10, 5 and 1 cents. Note Denominations: E200, 100, 50, 20 and 10. Coins: E5, 2 and 1, and 100, 50, 20, 10, 5, 2 and 1 cents. Note Denominations: kr1, 000, 500, 100, 50 and 20. Coins: kr10, 5, 2 and 1, and 50 öre. Note Denominations: SFr1, 000, 200, 100, 50, 20 and 10. Coins: SFr5, 2 and 1, and 50, 20, 10 and 5 centimes. Note Denominations: S£1,000, 500, 200, 100, 50, 25, 10, 5 and 1. Coins: S£25, 10, 5, 2 and 1. Note Denominations: NT$2,000, 1,000, 500, 200 and 100. Coins: NT$50, 20, 10, 5 and 1. Note Denominations: TSh10,000, 5000, 2,000, 1,000 and 500. Coins: TSh200, 100 and 50. Note Denominations: THB 1,000, 500, 100, 50, 20 and 10. Coins: THB 10, 5 and 1, and 50 and 25 satang. Note Denominations: TOP50, 20, 10, 5, 2 and 1. Coins: 50, 20, 10, 5, 2 and 1 seniti. Note Denominations: TT$100, 20, 10, 5 and 1. Note Denominations: TND30, 20, 10 and 5. Coins: TND5 and 1, and 500, 100, 50, 20, 10 and 5 millimes. Note Denominations: YTL200, 100, 50, 20, 10, 5 and 1. Coins: YTL1 and 50, 25, 10, 5 and 1 New Kurus. Note Denominations: TMT1, 000, 500, 100, 50, 10, 5 and 1. Coins: 50, 20, 10, 5 and 1 tenge. Note Denominations: UGX50, 000, 20,000, 10,000, 5,000 and 1,000. Coins: UGX500, 200, 100, 50, 20, 10, 5, 2 and 1. Note Denominations: UAH500, 200, 100, 50, 20, 10, 5, 2 and 1. Coins: UAH1 and 50, 25, 10, 5, 2 and 1 kopiyok. Note Denominations: AED1,000, 500, 200, 100, 50, 20, 10 and 5. Note Denominations: $U2, 000, 1,000, 500, 200, 100, 50, 20, 10 and 5. Coins: $U10, 5, 2 and 1 and 50 centécimos. Note Denominations: UZS 1,000, 500, 200, 100, 50, 25, 10, 5, 3 and 1. Coins: UZS 100, 50, 25, 10, 5 and 1, and 50, 20, 10, 5, 3 and 1 tiyn. Note Denominations: VUV5,000, 1,000, 500 and 200. Coins: VUV100, 50, 20, 10, 5, 2 and 1. Note Denominations: Bs.F.100, 50, 20, 10, 5 and 2. Coins: Bs.F.1, and 50, 25, 12.5, 10, 5 and 1 céntimos. Note Denominations: YER1,000, 500, 200, 100, 50 and 20. Coins: YER10, 5 and 1. Note Denominations: ZMK50,000, 20,000, 10,000, 5,000, 1,000, 500, 100, 50 and 20. Coins: ZMK10, 5 and 1, and 50 and 25 ngwee. Note Denominations: Z$200,000, 100,000, 50,000, 10,000, 5,000, 1,000, 500, 100, 50, 20, 10, 5 and 2. Coins: Z$5, 2 and 1, and 50, 20, 10, 5 and 1 cents.